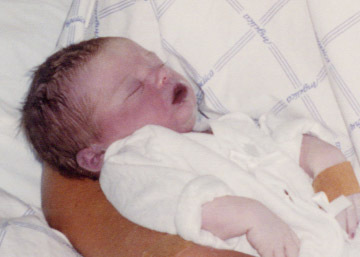 My fourth child, Julia "Rose", was stillborn on July 1, 1998 just three days before her due date. After three healthy children I never imagined that this could happen, especially since this pregnancy had been the easiest one for me. When I cultured positive for group B strep in early June, all four of my obstetricians made GBS seem as if it wasn't anything for me to worry about although they couldn't or wouldn't tell me much about it. (Women should have accurate information to know how to best protect their babies.) I had never heard of group B strep before and, since my baby books at home made no mention of it, I falsely assumed that the doctors must be right. My OB's did not give me accurate information as to how to help protect my baby from GBS nor any indication that losing my baby was even possible as a result of my being GBS positive.